Discontinuity is one of the subtler impression challenges. Want to avoid lab confusion and remake headaches in your smile design cases? Even the most experienced dentists can make unexpected mistakes if they don’t fully anticipate how to think like a lab. In this post, we’re giving you the lab’s perspective on how to avoid frustrating remakes from impressions with discontinuity. Discontinuity is an error that we have found to be much less common than our previous impression challenges. In general, ‘pulls and bubbles,’ lack of topography, and the crown/prep nightmare caused by flexible trays show up far more often in our experiences at the lab. In the end, this means that when we do come across a case of discontinuity, the remake can be a source of surprise and upset. 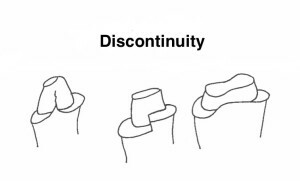 Discontinuity is a preparation issue. Is there even the slightest discontinuity in the line of the preparation design? If the answer is yes, it’s time to go back to the drawing board and restart the entire impression process. What dentists don’t realize (and is painfully obvious to the lab) is that when the lab is working in porcelain they are dealing in incredibly small measurements. Because of this, what may seem an inconsequential discontinuity from the dentist’s perspective can ruin the entire impression from the lab’s perspective. Good preps are clinically superior. Continuous form is the key to clinical superiority. We cannot emphasize enough the importance of this factor in preventing remakes. 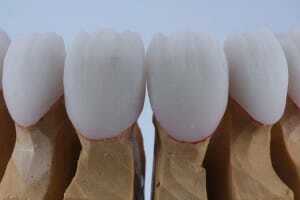 There is no way to make the veneer if the dentist is too intent on “saving” healthy tooth structure. They decide to take the impression down a 10th of millimeter, thinking there will be no consequences. But even the tiniest of discontinuities can become an enormous problem in the lab. To really “think like a lab,” check out the first four impression challenges in our troubleshooting series.